Slightly tongue in cheek but I love this one. It disrupts the distraction of mobile phones in the original home of social media – the pub. 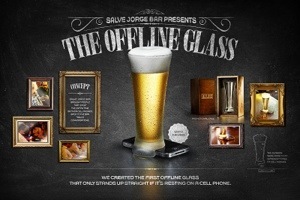 Invented in São Paulo by Marucio Perussi for Salve Jorge Bar to get people off their phones – the glass falls over if you don’t rest it on your phone. Love it, absolutely love it. Hope you can buy them in Australia soon. Who doesn’t need one of these – I know I do.